With all the crazy stuff going on, how am I supposed to know what to do? Father, give me wisdom as I begin this new day. Help me to use my time, the time You have allotted me, wisely, not wastefully. Father, give me wisdom as I write these words. Please put words into my mind and allow them to flow into thoughts that are good news to the poor, that announce pardon to the imprisoned, recovery of sight to the blind, words that set the burdened and battered free, and words that announce, "This is God’s year to act!" (Luke 4:18-19 MSG). Father, give me wisdom so that when I speak I will say things that are pure and clean and words that help and give life to those who listen. Father, give me wisdom to lead my family in ways that help them walk closer to You. Give me wisdom to be the husband that honors my wife and allows her to be respectful of me. Give me wisdom to be the father that understands my children and helps to give them the confidence they need to fulfill the dreams You have placed in their hearts. Give me wisdom to love my daughter-in-law so she can have peace in her heart as a wife and a mother. Give me wisdom to love and protect my granddaughter so that she will grow strong and feel Your presence every day of her life. Give me wisdom to share the wisdom You give me with these special people so that they can be the people You want them to be. Father, give me wisdom to counsel people who come to me for help. Give me the wisdom to know when to speak and when to be silent, when to be bold and when to be gentle, when to instruct and when to listen. Father, give me the wisdom to know when to be angry, when to be sad, when to laugh, and when to cry. Give me the wisdom to know that forgiveness is always the right move. Give me the wisdom to always accept Your forgiveness and to realize I am worthless without it. 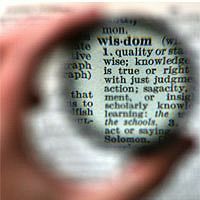 Give me wisdom to depend on You as if my life depended on it, and the wisdom to realize that it does. Father, give me wisdom to lead others in their walk with You. Give me the wisdom to preach and teach in ways that illustrate Your great and amazing love for us, and the wisdom to help others understand the living sacrifice that is appropriate and brings You pleasure. Give me the wisdom to live the words that I proclaim. Father, give me wisdom to realize that when I ask for wisdom with confidence You will give it. And that unless I receive wisdom that comes from You I have no words worth hearing, no life worth imitating, and no wisdom worth sharing. Father, there is no wondering "if" I need wisdom. I need wisdom. I need YOUR wisdom. Father, please give me wisdom. "When You Need Wisdom" by Tom Norvell is licensed under a Creative Commons License. Heartlight encourages you to share this material with others in church bulletins, personal emails, and other non-commercial uses. Please see our Usage Guidelines for more information.